Antique Jeweled Tiffany Reading Floor Lamp. Adjustable Light Shade Free Standing. 120 glass pieces and 84 beads. Requires: 1 E27 Type A bulb x 60 watt (not included). Dimensions: 12 inch diameter x 62 inches high Shade Depth - 5.75 inches. Handcrafted using the same techniques that were developed by Louis Comfort Tiffany in the early 1900s, this beautiful Tiffany-style piece contains hand-cut pieces of stained glass, each wrapped in fine copper foil. Attention California residents: This product may contain lead, a chemical known to the state of California to cause cancer and birth defects or other reproductive harm. Note: Shade colors will appear darker and less vibrant when not illuminated. Add a touch of elegance to any room with this handcrafted Antique Jeweled Tiffany Reading Floor Lamp. The warm dark brown finish stands in contrast to the contemporary shade which contains 120 piece of glass and 84 decorative beads. This one-light floor lamp is activated by a floor switch and fits both vintage and contemporary design schemes. 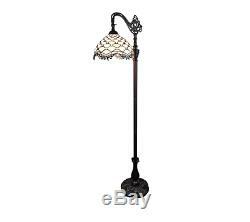 Antique Jeweled Tiffany Reading Floor Lamp Adjustable Light Shade Free Standing. All inventory is in stock when listed, our system is tracking 24/7. We will offer "similar" items if they are available. Any product you return must be in the same condition you received it and in the original packaging. 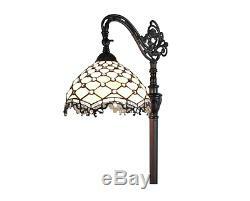 Thank you for your interest in the Antique Jeweled Tiffany Reading Floor Lamp Adjustable Light Shade Free Standing. 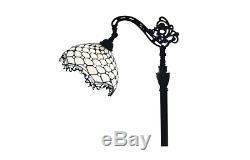 The item "Antique Jeweled Tiffany Reading Floor Lamp Adjustable Light Shade Free Standing" is in sale since Thursday, August 3, 2017. This item is in the category "Home & Garden\Lamps, Lighting & Ceiling Fans\Lamps". The seller is "dealz2share" and is located in Multiple Locations. This item can be shipped to United States.